Granite is one of the world’s toughest materials and has been used in buildings for thousands of years. A natural stone, it is formed by extreme heat and pressure deep underground. Find out more about the origins of granite, or read on for some perhaps surprising uses of the stone. From gravestones to temples, monuments that are intended to last down the generations are often made of granite. Before power tools existed, carving granite was laborious and time consuming, so the stone was often reserved for important projects. What do Roman bridges, the Pyramids and cathedrals have in common? Granite, of course! Many ancient and historic buildings use granite to create a core of strength at their centres. As granite can be polished to a beautiful sheen or clad in another stone, it was commonly used for supporting pillars. Polished granite is a stunning natural stone, and is often used alongside marble in stone floors. While marble often has very striking veining, granite typically has a more subtle patterning making the two stones perfect complements. Granite paving slabs are ideal for use outdoors as they are very tough and weather-resistant. Many people are surprised at the number of shades of granite that are available – paving slabs come in a wide range of hues, from red to green, as well as the well known greys and blacks. Rough hewn granite looks very different from the high gloss finished stone you’ll often see indoors. Many cultural groups use rough hewn granite as building blocks or cladding for important buildings such as town halls and religious buildings. As natural granite is available in many colours, it’s entirely possible to create a mosaic or tile pattern using only this stone. 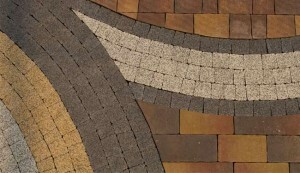 Using a single type of tough stone is a good way to ensure that no part of the patterned floor wears out. Modern technologies allow us to cut granite into thinner tiles than ever before, making it an ideal choice for a backsplash or tiled bathroom. Granite is waterproof and stain resistant, so it can easily handle the damp and dirt. 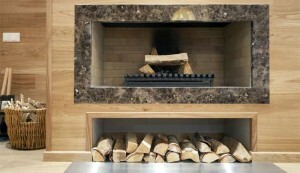 Using larger slabs of granite is a great way to preserve and display the beauty of the stone. Granite mantels and stairs are popular thanks to their blend of beauty and practicality: granite mantels won’t catch fire and granite stairs won’t wear out. While many kinds of granite are common enough to be affordable building materials, a few are both rare and stunningly beautiful. These may be used as gemstones and set into jewellery. A recent example is the discovery of K2 Azurite Granite in the Himalayas. With a stunning blue tint, this rare stone is prized as a gemstone. Last but not least, granite is a popular choice for kitchen worktops. Granite is waterproof, stain resistant, heat resistant, easy to clean and hard to damage making it a very practical choice for the kitchen or bathroom. That it’s also beautiful is simply a bonus!